Good evening – here I am writing from Jolly Harbour, outside Al Porto restaurant in Antigua. I should be in bed. I am completing the RYA Competent Crew course with Miramar Sailing in Antigua. Our group are early risers. We had a full day starting with man overboard manoeuvres. Then, we took to the Atlantic, departing through Goathead channel, which is southwest of Antigua. Through the channel, we were cautious. Goathead channel requires navigating between rocky coastal outcrops and a reef. The reef is where dive boats hover, and waves break. Admittedly, I am perhaps overstating the danger of this route. The channel was 0.4 nautical miles at its narrowest part. But, to a new sailor like me this doesn’t feel like a lot of wiggle room. I am not a light touch on the helm. As we approached the channel, I saw a Leatherback turtle swimming on the surface of the water. It disappeared after a few seconds. It which was roughly the size of a manhole cover. We motored through Goathead channel to save time and perhaps our instructor’s nerves. Motoring allows us to travel in a straight line. Sailing, on the other hand, is slower and involves doing a series of zigzags. As we cruised along, I wondered to what extent our family will rely on the motor when we are sailing. Out in the Atlantic we had the sails up again and the waves were big and varied. Some felt like speed bumps, and others felt like we were riding down steep toboggan hills. The Atlantic ocean is dark blue – somewhere between royal blue and navy. It is a sharp contrast to the cyan-coloured waters of the Antiguan coast. As we rode the waves, the boat twisted about and one of our crew said she thought that the waves were developing her core muscles. Meanwhile, I munched on ginger candy trying to control my queasy stomach. We headed back towards Jolly Harbour. The queasy feeling left me as soon as we passed the reef, which acted as a wave breaker. 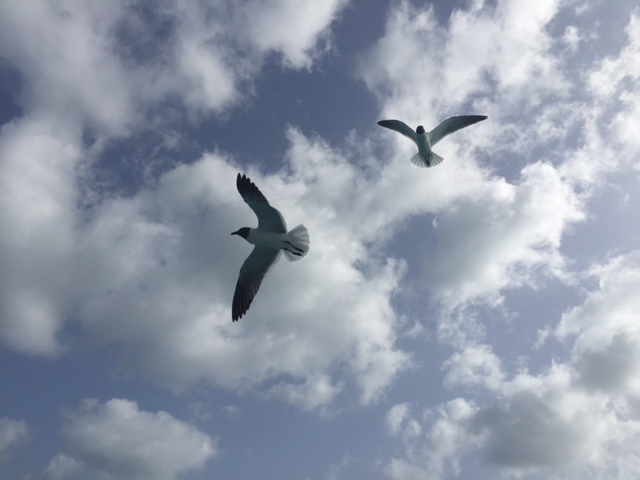 Sea birds hovered about our boat as we approached the Jolly Harbour marina. Our skipper, Ian, said that the birds probably thought we were a fishing boat. We had about five birds following us until Ian tossed them some bread. Here is a picture of two of the sea birds. We ended the day by practicing mooring. Reversing the boat wasn’t as difficult as I’d thought. It is much like backing a car into a parking space. Tomorrow, our instructor plans to have us slalom amongst some mooring buoys to gain further practice. Things I need to work are collision regulations and knots. And, now I’m off to bed. Our group tends to start sailing at about 8:15 a.m.